Thunder Bay has come back to life. This once booming city – population approximately 110,000 – has lost much of its original resource-intensive economic base. In recent years it’s revitalized itself. It has diversified, and become a regional centre for North Western Ontario. 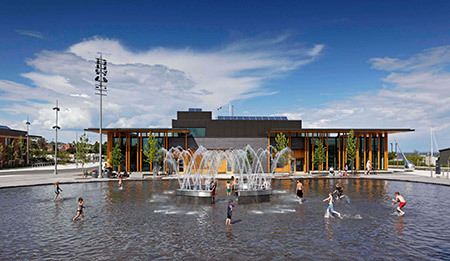 The Thunder Bay waterfront is a crucial part of this success story. It has been developed by the City as a mixed-use community. The aim was to strengthen the sense of community identity, to connect the waterfront with the downtown, and to stimulate economic growth by attracting inbound investment and giving residents a compelling reason to stay. “Prince Arthur’s Landing” is the name of this project. The city appointed Brook McIlroy, the internationally recognised Toronto-based architecture firm, to develop the Master Plan. The same firm was chosen as the continuing lead consultants, providing all the scheme’s architectural services, including landscape architecture. The Master Plan was adopted by Thunder Bay City Council in 2009 and received over $30 million from the Infrastructure Stimulus Fund (ISF). The City was also able to attract a private sector partner to build two 7 storey residential buildings plus a 150- room hotel. Brook McIlroy was commissioned to create a development that was people- friendly, visually inviting, and diverse in building form and function. Other objectives were to expand and enhance the Marina Park, to add more usable public space, and to improve the existing trail system. Brook McIlroy realized the design with sensitivty and flair; among the scheme’s award- winning elements are the Baggage Building Arts Centre, the Water Garden Pavilion, and the Gathering Circle and Spirit Garden. These last elements are especially important to the social impact of the project. Thunder Bay has a large Native Canadian population; and yet this founding culture, which has inhabited the shores of Lake Superior for over 9000 years), is virtually invisible in the fabric of the cityscape. The Gathering Circle – a traditional bentwood structure – gives physical expression to the deep cultural and historic roots that connect Aboriginal peoples with the Lake Superior shoreline. It has been designed in conjunction with an Aboriginal intern architect and with input from the Aboriginal communities. Recently Lakehead University has made arrangements to use the Gathering Circle as an outdoor classroom to teach students Canadian history. It is also becoming a prime destination and learning resource for tourists from Europe and elsewhere seeking to learn about Canada’s Aboriginal society. The two principal buildings on the site – the Water Garden Pavilion and the Baggage Building Arts Centre – are sustainably designed and will be LEED Gold certified, employing energy conservation strategies as well as healthy building technologies and materials. The Prince Arthur’s Landing commission led Brook McIlroy to open a Thunder Bay office in the summer of 2010 to manage the project and develop a presence within Thunder Bay and the surrounding communities. Partners Calvin Brook and Anne McIlroy and key staff from the Toronto office work regularly within and remotely on projects involving communities and clients in Northern Ontario. For a $22 million investment, the City of Thunder Bay has leveraged a $130 million revitalization project. The public sector components were completed in October 2011 and private sector construction is well advanced. Since opening on December 16th, 2011 the Prince Arthur’s Landing project has exceeded all projection for daily attendance bringing residents, tourists, arts culture and business entrepreneurs to the waterfront and the downtown. The impact of the project is reflected in a 3.5% increase in tourism expenditures over one summer season. Dominating the Lake Superior horizon is the awe-inspiring land formation known as the Sleeping Giant. With its lakeside benches, its walking trails and its Spirit Garden, Prince Arthur’s Landing is a serene site from which to contemplate the view. Thunder Bay itself may once have resembled a Sleeping Giant, but with this project and all the economic possibilities it opens up, the Giant is now fully awake. Structural: Blackwell Bowick Partnership Ltd., AECOM Canada Ltd.
Landscape Architects: Brook McIroly, AECOM Canada Ltd.